The Denver Botanic Gardens was lucky enough to have one of their Corpse Flowers (Amorphophallus titanum) bloom this week. You may have heard. Not only was it all over the local news, a quick search turns up articles in the New York Times, USA Today, The Washington Post, and one in Mental Floss highlighting “Stinky”, DBG’s name for the thing. Friends and I all waited with bated breath while watching the 24 hour live web cam days in advance, for the first signs of blooming. I was checking the live stream at all hours of the day, and night, at work, at home and anywhere I had an internet connection, when about 7:30 pm on Tuesday night we saw the first of the petals begin to unfurl. DBG planned to be open until midnight the night of the bloom, however there was a concert scheduled at the gardens that evening, so very few people got to see it. 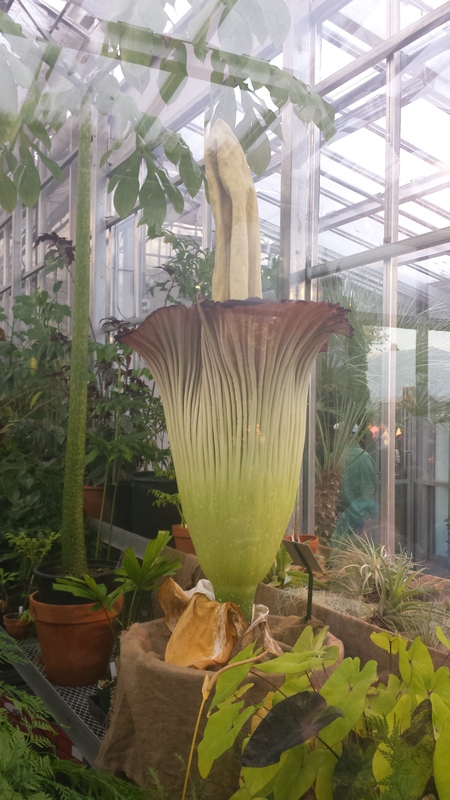 They say the stink of the bloom only lasts about 10 hours, so, of course, we wanted to go see it right away. Wednesday morning I had to teach a class, and couldn’t line up at 6am with the flock of people all excited for this momentous occasion, but picked up my son (my junior botany enthusiast) from home at around 12:30 after class to drive the hour and a half down to Denver. 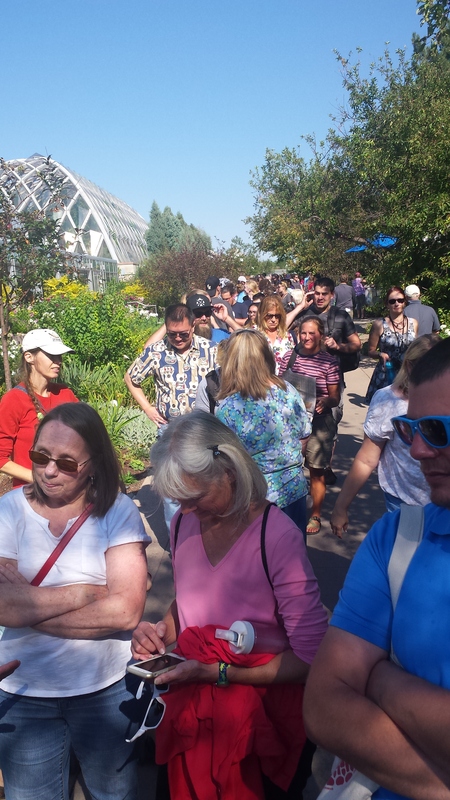 I figured it might take us an hour or two to wait in line, see the flower, and we’d still have a little time to look around the rest of the gardens before heading back home for back-to-school night. Boy was I ever wrong! When we walked into the DBG the atmosphere was excited and people were happily buzzing around like bees everywhere. So I bought our tickets and went to stand in the line to see Stinky. The friendly volunteer manning the entrance to the line informed us that it would be about a 3-4 hour wait to see the flower. Woah! OK, so we won’t get to see the rest of the gardens today, and we’re going to have to hurry back to get to the school on time; surely 4 hours is a bit of an over estimation. We happily chatted with the nice lady in line behind us, and munched on a sandwich as the line seemed to be snaking along rather steadily. We passed the time identifying the flowers and plants we passed, watched some unusual bugs pollinating some unidentified asteraceaes and taking in the the gardens around us, which are fantastic this time of year with almost everything in bloom……for 3 hours or so this kept us somewhat occupied and content. Contentment quickly began to wane. At about the 3 1/2 hour mark I realized we weren’t going to make it back home in time for back-to-school night, but we couldn’t give up now…we were so close! Almost 5 hours after we arrived the enormous flower came into view and a bit of enthusiasm returned. We were up next! As we approached everyone in line began to sniff the air and speculate if that subtle smell or this one might belong to the corpse flower. I caught a whiff of something like rotting fruit; that might be it. They had taken down the glass of the greenhouse in front of the flower so you could get good pictures and maybe get a smell of the notorious odor. Pictures taken quickly and air sniffed thoroughly we were herded along, around the corner where the air in the greenhouse was vented for a better aromatic experience. I saw the thing, now I wanted to smell it! On the back side of the greenhouse you could feel the air blowing out into a small room which clearly isn’t usually open to the public. It smelled a bit like mildewy air filter and dirty laundry, I don’t think that’s what the flower is supposed to smell like. So I did see it, I’m not sure if any of the scents that reached my nose belonged to Stinky or not. In conclusion: That was the longest line I’ve ever waited in in my entire life, I got to see something pretty cool, briefly, but I still don’t know what a blooming Corpse Flower actually smells like. 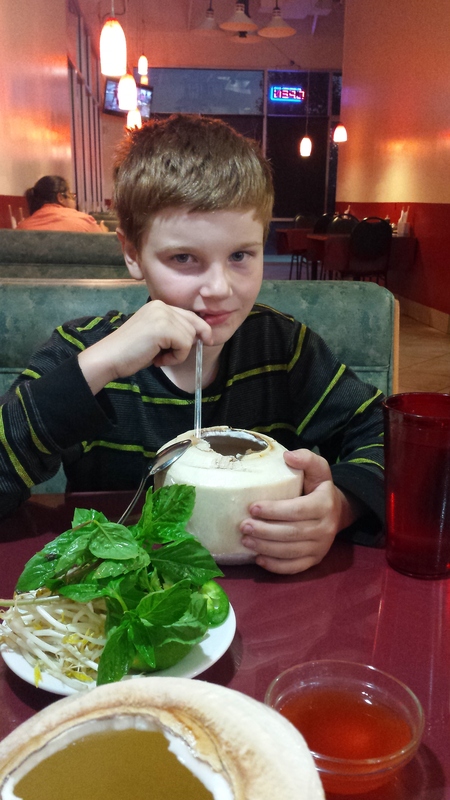 Afterword, we stopped at one of our favorite Vietnamese restaurants on the way home and found a much simpler but more satisfying experience in drinking from fresh coconuts and and eating exceptional food too late at night the day before school started. The coconut was worth the wait! 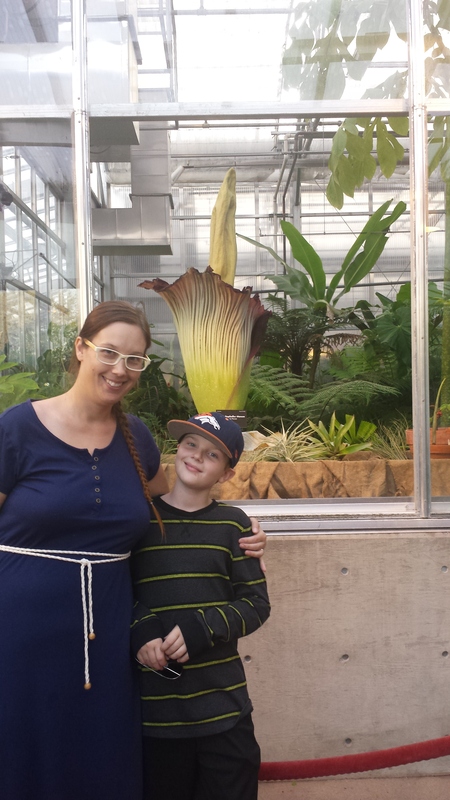 I hope when my son’s new teacher asks “how did you spend your summer vacation”, he doesn’t say, “I waited in line for most of it” , and instead he says, “I had a once in a lifetime experience, and saw a blooming Corpse Flower.” I just don’t know which part he’ll remember more. How about a little Corpse Flower fiction or poetry?